The Everpurse has arrived on Kickstarter and it is a really interesting project that may well have huge potential. The Everpurse is a wirelessly rechargeable purse that can power your iPhone just by slipping it into a pocket inside of the purse. The confusing part is to how it actually charges the iPhone. It appears that it is doing it wirelessly however it is more likely that the pocket inside of the purse has a dock connector at the bottom that the iPhone slots into easily due to the size of the pocket. Ever notice that your smartphone dies JUST when you need it most? We set out to build something so powerful and easy to use, it would make charging your phone an afterthought. 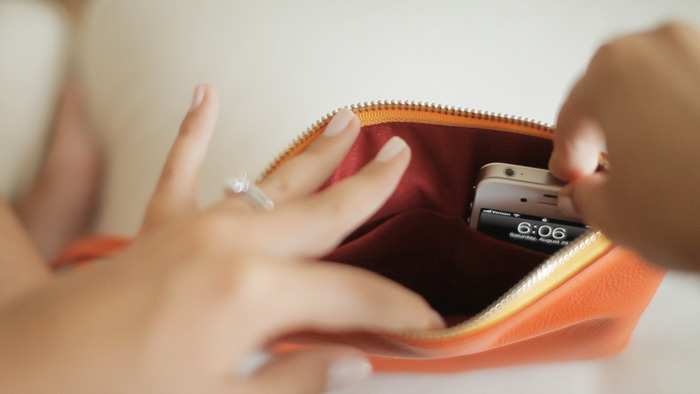 To charge, all you have to do is slip your phone into the Everpurse pocket! Whether you're at work or out on the town, your Everpurse will keep your phone charged all day long. You can carry your Everpurse inside a bigger bag, or by itself. When you get home, simply drop your Everpurse on the white charging mat for wireless charging! My husband (a serial technology entrepreneur and prototyping enthusiast) and I (a social worker) started building Everpurse for fun over a year ago. It began as a quest to make the perfect purse. One that would let me go through the whole day without ever thinking about charging my phone. It also had to look gorgeous. I was tired of awful charging solutions that were bulky, ugly, and simply a pain to use. Many prototypes and iterations later, we've gotten it down to a beautiful science! Everpurse is now patent-pending and ready to manufacture. The Everpurse is fully rechargeable and comes with a white charging mat that you just drop it on when you get home. It is then fully charged and ready for the next time you leave the house. The Everpurse will be available in three different colors and in fabric or leather varieties. The most interesting part of this project is the fact that no modifications have to be made to the iPhone and it doesn’t need to have any special case either. There is no explanation as to how this actually works but it can't be a wireless charging solution without the need for some sort of case; it must have some sort of physical connection within the purse. If it does work in any other way then this could be a very significant development and one that is sure to take off with massive interest. Shame it is only suitable for those that carry a purse on a regular basis but I am sure other solutions could be brought to market that could utilize this technology in other ways too. If you like the idea of the Everpurse, you can become an early adopter with a pledge of $99 which will secure one fabric purse complete with white charging mat; should they make it into production. The Everpurse currently has 34 pledges amounting to $4282 and still has a long way to go before it reaches it funding goal of $100,000; it still has 33 days to go and I would not bet against it reaching that target either. What do you think of the Everpurse? Do you think it has great potential?